Given the condition of the masking tape protecting the cut edges of the canvas, it’s been sitting around a while. I’ve never been all that fond of needlepoint. I only occasionally am interested in embroidery, which is why I was willing to pay all of $2 for the frame. The project has only one square and part of the border to complete. I could, if I wanted to, get a similar yarn, rip out some stitches and finish it. It was apparently intended for a small pillow. I have no idea what the initials might be. 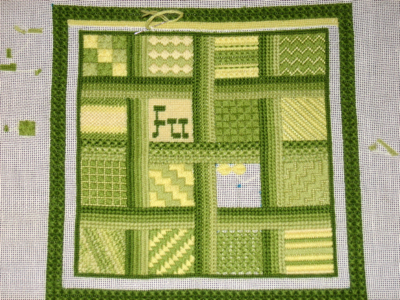 Posted by feorlen on 19 October 2008 at 6:27 pm under sewing. I was going through the fiber closet and came out with a bag full of random cotton rug warp, originally from tablet and inkle projects. There wasn’t enough to do much, but I figured two mostly full spools of light and dark blue would work for a narrow fabric. I’ve been meaning to make another bag to hold my phone. Narrow fabric on the big loom is a problem because my end feed and boat shuttles are longer than the warp is wide and don’t work well passed from hand to hand. So I dug out the table loom and emptied some stick shuttles. I don’t really like the table loom, direct tie-up drives me nuts. Opening sheds one lever at a time is slooooow. Also this loom uses texsolv heddles, which refuse to move around easily. So I took out the other six harnesses and warped it for tabby. I’m doing a very basic log cabin pattern, squares of stripes in alternating directions. 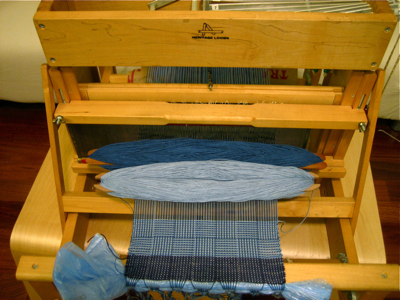 The structure is plain weave but the pattern comes from the color arrangement. I’ve got enough for about 3m of finished fabric, 20cm wide. That’s fine for little bags and the yarn is indestructible. Posted by feorlen on 5 October 2008 at 4:43 pm under weaving.